Everything was perfect! We will be happy to visit them again. Very nice garden with kids corner and lovely view from the balcony of our apartment. Rooms were nice and clean, air-conditioned. Hotel is in a calm area, a couple of streets away from the dust and noise of the main road. The hosts were very kind - bringing us homemade cake and sweets, friendly with the kids. Great hospitality! Amazing view from the apartment on the 3rd floor! I like the garden very much, save for my baby 1 year old. The host was really very helpful, welcomed and nice with all of us. Много приятно място. Да, сервираха ни страхотен кекс на верандата, въпреки че бяхме без опция за закуска. Домакините са млади, интелигентни и естествено любезни хора. Просто това е място за отсядане, където подсъзнателно си записваш за следващи мечтани екскурзии. Отличный апартамент с панорамным видом на море, прекрасная терраса. Гостеприимство хозяев. Кровати удобные, белье свежее. Парковка рядом с домом. До моря ~300-400 м. Но дом расположен на возвышенности, не всем будет удобно. Große, helle Räume. Gepflegter Garten. Ruhige Lage. Badezimmer sehr groß. Kavalaya yakın.Ev sahipleri çok güleryüzlü ve ev çok temiz. Lock in a great price for Our House / Luxury Apartments – rated 9.4 by recent guests! One of our best sellers in Paleo Tsifliki! Offering free WiFi and a barbecue, Our House / Luxury Apartments is located in PalaiónTsiflíkion. Kavala and Kavala Port are 5 mi away. The accommodations is air conditioned and is fitted with a flat-screen TV. There is a seating and/or dining area in some units. A fridge and stovetop are also provided, as well as a coffee machine. Some units also have a kitchen, fitted with a microwave. There is a private bathroom with slippers and free toiletries in each unit. Towels and bed linen are offered. Our House / Luxury Apartments also includes a sun terrace. The property also offers grocery delivery. Several supermarkets and beach bars can be found nearby. Dráma is 20 mi from Our House / Luxury Apartments. The nearest airport is Kavala International "Megas Alexandros" Airport, 14 mi from the property. When would you like to stay at Our House / Luxury Apartments? This sea-view suite features classic decoration. It consists of a main room which includes a bedroom, a kitchen, a dining room, a bathroom and a spacious seating room with a TV and a fireplace. It includes a large porch with views of the Aegean Sea, the island of Thassos and the garden, filled with roses. This air-conditioned apartment consists of two levels connected with an indoor staircase. The apartment features two bedrooms, a kitchen, a living room and a bathroom. 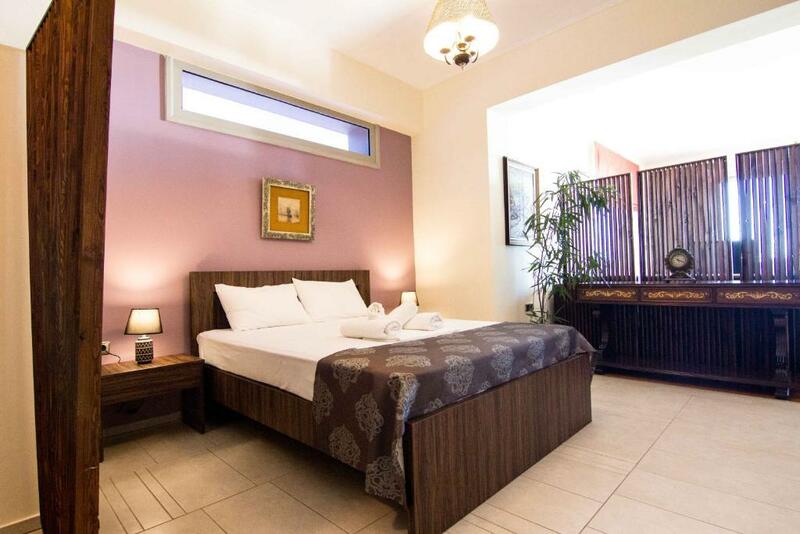 A TV is available, while a terrace with view to the mountain and the sea is available in each bedroom. OUR HOUSE/Luxury Apartments is a luxurius establishment which consists of 3 fully and partially furnished flats. 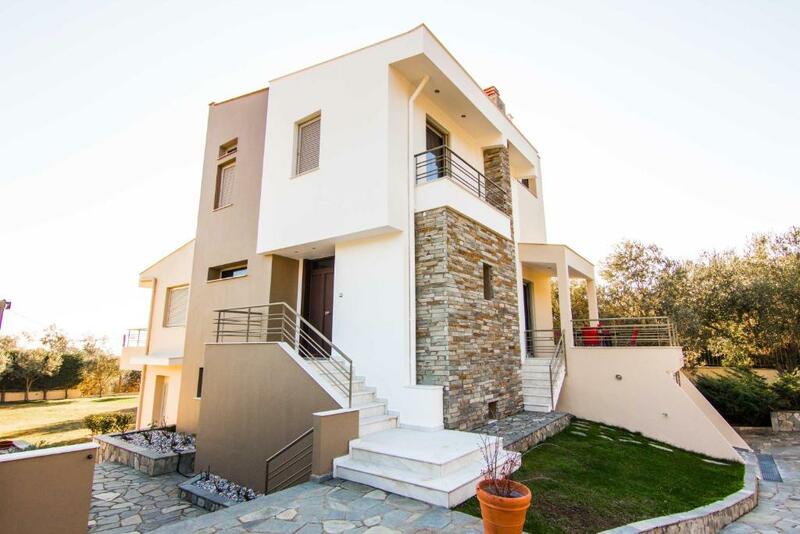 The estate is in the location of Palio Tsifliki in the Prefecture of Kavala ,far away from the fuss and the anxiety of the city, 10 Km west of the city of Kavala, an ideal destination for every season for those seeking the tranquility that nature , sun and sea offer for their vacation. OUR HOUSE/Luxury Apartments is just 400 m away from the organized beaches of Palio, with the golden sand and green coasts. The city and the harbour of Kavala are just 8 Km away and just 40 Km is located MEGAS ALEXANDROS airport of Kavala. The seaside villages of N. Iraklitsa and N. Peramos (Ammolofoi sand-hills) are ideal for your evening escapes and dives in their crystal waters. Close to OUR HOUSE/Luxury Apartments you can find everything you need to make your stay more comfortable like taverns, beach bars, caffes, small shopping markets, drugstore, bakery, and a park for your kids and grown ups. House Rules Our House / Luxury Apartments takes special requests – add in the next step! Please inform Our House / Luxury Apartments of your expected arrival time in advance. You can use the Special Requests box when booking, or contact the property directly using the contact details in your confirmation. Beds were a bit uncomfortable, a proper shower hanger missing in the bathroom (you have to hold it to take a shower). A bit poor utensils in the kitchen, but generally OK and having the most necessary. Not so far from beach, but road is very steep and we went by car. A beautiful house with super kind hosts. It was stylish, very clean, super comfortable and quite. If you a looking for a classy and big apartment, with beautiful view - this is the place! The kitchen has only one very small hot plate, I needed more facilities for preparation of baby's food.